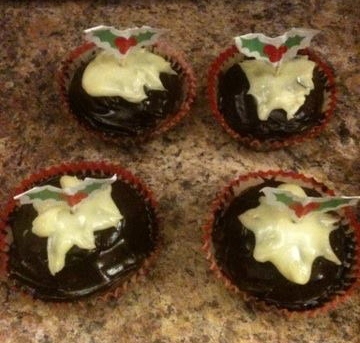 So this week, I decided to make Christmas-themed cupcakes as a parting gift to my coursemates. I like to think they will miss me and my baking over the holidays, although as it is nearly Christmas, they probably don't need my help to put on weight. Here we have double chocolate Christmas pudding cupcakes, peppermint and chocolate Christmas tree cupcakes and vanilla and white chocolate candy cane cupcakes. These cupcakes are pretty stunning looking, and so easy to do. They'd make great party food. The decoration, I am proud to say, was all of my own invention. I was particularly proud of using icing sugar on the Christmas trees to represent snow. I made these cupcakes in ridiculously small batches, but it's much easier to make them in bigger batches. You can freeze cupcakes as long as you freeze the cupcakes and buttercream separately. Do NOT refrigerate either. They will not like it. To find my buttercream recipe, go here. This recipe makes about enough buttercream icing to cover 24 cupcakes. I promise I will do one on this blog soon. Maybe. You will see that the icing I used here was pretty brightly coloured. This means you will need to use a fair amount of colouring. Use paste NOT liquid colouring. Seriously, this is important. If you find that the colouring makes the icing lose its consistency, add more icing sugar gradually and continue beating, it should regain the consistency you want. By the way, the Christmas pudding cupcakes are not actually Christmas pudding flavoured. This is because I hate Christmas pudding. In my house we set fire to the pudding, all clap, and then throw it in the bin. Although we generally wait for the flames to go out first. 1. Preheat the oven to gas 4/180C. Cream the butter and sugar together until light and fluffy. 2. Beat the eggs in one at a time. The mixture will look like sick. Don't worry. It's supposed to. 3. Sift the flour and cocoa into the mixture and fold in gently. 4. Distribute the mixture between 24 cupcake cases. 5. Bake for 12-15 minutes until cupcakes are risen and tops spring back when lightly pressed. 6. While the cupcakes are baking, put a ceramic/glass bowl on top of a saucepan of barely simmering water. Break the dark chocolate into pieces and add 200ml of cream, then melt the two together until completely combined. Take off the heat and put aside. Repeat the process with the white chocolate and remaining cream. 8. When both the cupcakes and the ganache have cooled, cover half the cupcakes in the dark chocolate ganache, spreading the ganache with a knife. 9. Drop a teaspoon of the white chocolate ganache on top of each chocolate covered cupcake and tease it the desired shape. Which is basically a splodge. 10. 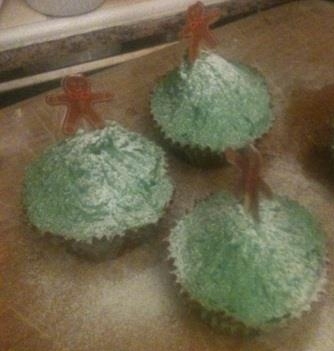 To decorate the remaining cupcakes, colour the buttercream green and flavour it with peppermint. Spread the cupcakes with buttercream, spreading upwards to create a vaguely conical shape. Then take a cocktail stick and create a shaggy texture by drawing little grooves in the buttercream all over. Dust with icing sugar just before serving. 2. Beat the eggs in one at a time. 6. While the cakes are baking, put a ceramic/glass bowl on top of a saucepan of barely simmering water. Break the chocolate into pieces and add the cream, then melt the two together until completely combined. Take off the heat and put aside. 7. Split the buttercream into two equal parts and colour half of it red. Put each colour in an icing bag with a star shaped nozzle. 8. When both the cakes and the ganache have cooled, cut the tops off the cakes so that they are flat. Spread each cake with ganache. Pipe 6 evenly spaced splodges of one of the icing colours around each cake. Then repeat with the other colour. 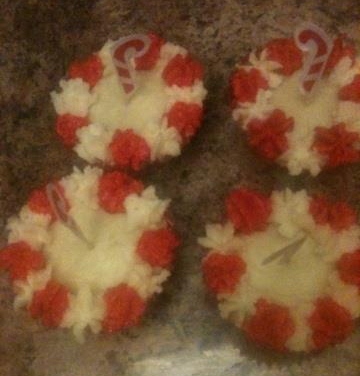 If, unlike me, your kind parents have not bought you cupcake toppers, you could make your own candy canes by rolling red and white sugarpaste into lines and then twisting them together. If you are good at cutting precise shapes you could probably cut out tiny holly leaves out of green sugarpaste and roll little berries out of red to top the Christmas pudding cakes. And you could decorate the trees with stars or edible silver balls. I also make gingerbread decorations from my friend Charlie's recipe this week. If you're making decorations rather than gingerbread for eating, roll the dough thin and make a hole in each gingerbread before baking, allowing for shrinkage whilst baking. Make small shapes as heavy gingerbreads will break and once cooled, thread a length of red ribbon through the hole of each gingerbread to hang it by. Merry Christmas everyone! More to follow before then.